As you’ve probably gathered by now, out here in the Gulf of Mexico we are on a hunt. Not for food or large mammals to shoot pictures of; we are on the hunt for chemicals. Elements ranging on the periodic table from those as commonly known as oxygen and iron, to others rarely ever mentioned, such as Polonium or Neodymium. While the results of this massive search effort will not be entirely known for months yet, there is a reason we are on the search for these elements. One of those reasons is to determine how hypoxic conditions might be affecting the amounts of iron in the water. It is well known and understood that lack of oxygen limits growth of many organisms, but Dr. Silke Severmann is interested in investigating a step further: is the lack of oxygen in these waters causing other elements to be removed from the water as well. One such element, iron, is the focus of her re-search. Bacteria play as vital a role in marine ecosystems as they do in terrestrial ecosystems. On land, their most important role is as decomposers. The same is true for bacteria in marine ecosystems. They are responsible for decay; as they break down dead material in the environment, they turn what would otherwise be waste, into a source of energy. Organisms function by getting energy from the bonds of chemicals. The bonds that form are the result of the arrangement of electrons. The chemicals are like the gas that’s in a car, the energy you get from burning the fuel is like the energy organisms get from breaking the bonds of electrons. “Organisms” includes you, me, plants, animals, bacteria, fungi, and any other living thing you can think of. We all need energy in order to survive. I told you before that we get our energy from the bonds between sugar and other organic molecules such as protein and carbohydrates. Well that was only part of the story. Not only do we need the bonds of the sugar to get energy from, but we require the oxygen present as well. The oxygen does not act as a source of energy, but rather as an electron acceptor that gives a place for the electrons to go. Remember the equation for respiration? Ultimately what happens in respiration is our cells take the sugar and break down its bonds for energy. When the sugar is broken down, the energy in its bonds get stored in special organic compounds (called ATP) for later use, almost like how a battery stores energy. The carbon, hydrogen, and oxygen atoms in the sugar molecule, C₆H₁₂O₆, are largely disposable- the cell does not need most of them. The cell is mostly interested in the energy between the bonds of those elements. That energy gets put into forming ATP (adenosine triphosphate) while most of the atoms themselves are discarded. They are discarded in the form of water and carbon dioxide. The original oxygen is only a receptor, or receiver for the extra carbons and electrons. The carbon is kind of like a donation box. Imagine you cannot buy any new items of clothing until you get rid of old items because you cannot fit any more clothes in your closet. For every item you donate, you can get a new one. Now imagine that you go to the donation box to donate some of those old items. The oxygen is kind of like the donation box. It accepts the extra carbon, forming CO₂. The sugar cannot be broken down for its energy without a place to donate the atoms and extra electrons. So what happens in environments where there is no oxygen available? You might think that nothing can live there. While finding large predatory animals might be difficult, many types of bacteria thrive in low-oxygen conditions. The cell cannot get rid of its byproducts without a place to donate them. They have developed a way to substitute other chemicals in place of the O₂. One such chemical is sulfate. Sulfate has the chemical formula SO₄²⁻. Sulfate is like an alternative to oxygen molecules (O₂). It can accept donations. Not only do oxygen and sulfur both accept extra atoms (carbon or hydrogen), but they can accept extra electrons as well. Sulfur is not used normally because its donation box is not as empty as oxygen’s. It doesn’t accept electrons as readily as oxygen does. Nevertheless, it is a good alternative if there is no oxygen available. When an atom accepts electrons, we call that process reduction. If an atom gives away electrons, we call that process oxidation. When oxygen or sulfur accepts electrons they are being reduced. That’s why the bacteria that utilize sulfur are known as Sulfur Reducing Bacteria (SRB). Our cells require oxygen to have a place to donate electrons. While oxygen is ideal as an electron receptor, other cells (certain types of bacteria), have figured out ways to use other elements such as sulfur, nitrogen, or even metals such as iron and manganese to accept electrons. This gives them the chance to use a source of energy that would otherwise be untapped. It’s kind of like this: imagine at a cookout all of your friends are standing by the grill waiting for the hamburgers to get finished cooking. You decide that while they wait for the burgers, you’re going to go ahead and capitalize on the hot dogs that no one else wants to eat. While you might get more full from a burger, the hot dog will still meet your energy demands. The ultimate result is that if there are sulfates in an environment, those sulfates will get reduced to sulfide (by SRB), the sulfide will trap iron and remove that iron from the water, resulting in waters that are not only devoid of oxygen, but devoid of iron as well. Producers require iron for their metabolic processes. A lack of iron in the water means that the growth of these organisms will be affected, in turn affecting the entire food chain that relies on those producers. 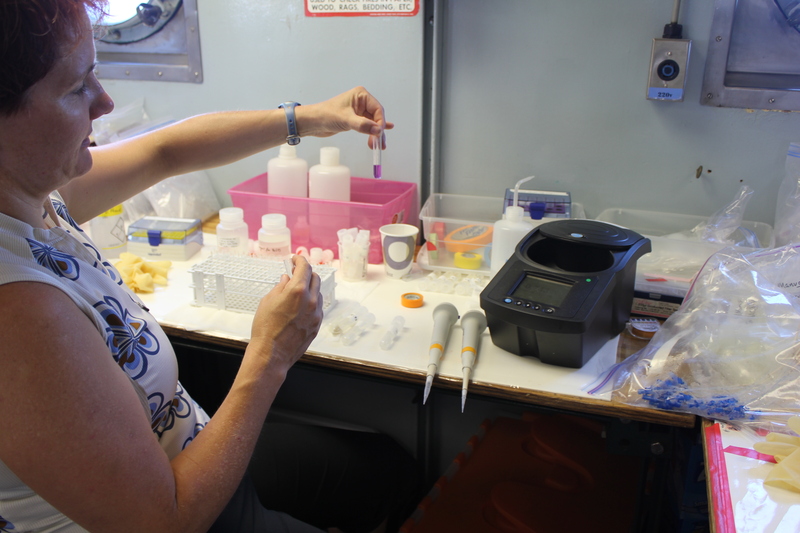 Dr. Severmann is interested figuring out if the lack of oxygen in Gulf waters is contributing to the removal of Iron from the ecosystem. Without oxygen, these sulfate-reducing bacteria will thrive, changing the sulfate to sulfide which ultimately traps the Fe in the water column and removes it so that it is not available for use by other organisms. By sampling the water she can determine how much sulfate, sulfide, and iron is present to determine if iron is being removed as a result of the proliferation of these SRB. When you consider the alternative, if there were oxygen in these waters, the SRB would be outcompeted by the oxygen-reducing bacteria. They are more suited to survive in environments that are high in oxygen, causing the SRB to be less successful. This would result in more iron being left in the water because sulfide is not produced (which would trap the iron, causing it to precipitate out of the water). Dr. Severmann has collected liters and liters of water to analyze for iron and sulfides. As the cruise nears its end she is finishing up the last of her collection out here in the Gulf. Tomorrow will bring some of the last of those samples and the beginning of the analysis.